CEO Adriano Farano says, after improvements to the playlist-creation experience on iPads, “we’re ready to start monetizing” — and expanding to Android. By Joseph Lichterman @ylichterman Feb. 20, 2014, 3:30 p.m. 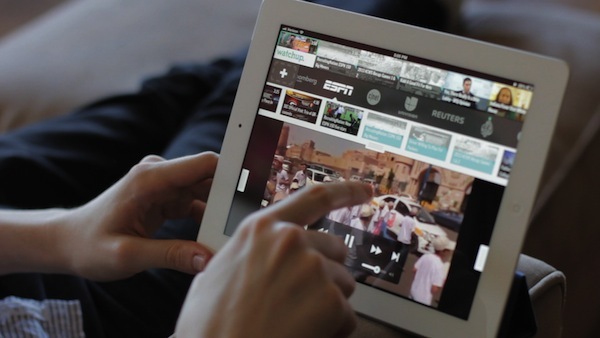 The news video aggregator Watchup aims, in a sense, to recreate something like the traditional television newscast experience, but redesigned for tablets. Soon it’ll have one of another element of that experience: ads. Watchup, the former Knight News Challenge winner with $1 million in fresh capital, is slated to release the latest iteration of its app next month, which for the first time will feature preroll advertisements via a new partnership with The Washington Post’s PostTV. Launched just over a year ago, Watchup creates personalized newscasts for users, culled from video from dozens of global and local news organizations. The newest version of the app, slated to be released on March 13, will bring the third iteration of its interface. Watchup CEO and founder Adriano Farano said the Post, like other news organizations, is looking for other opportunities to expand pre-roll video ad inventory. The Post’s ads will be incorporated into its videos that are played on the app; Watchup will get a cut of the revenue generated. The move is also a way for The Post to get its video content in front of more viewers. The paper has invested heavily in video production, launching PostTV last year. In December, the Post became the first news organization featured on Google’s Chromecast, and Andrew Pergam, head of video at the Post, said the paper is constantly on the lookout for video partners. “For us, what’s really important is producing really high quality video journalism and then figuring out how to let it spread on ways to reach all new audiences,” Pergam said. Most of Watchup’s content is integrated via public YouTube channels, but it now has about 12 partnerships with news organizations to directly provide content to the app, including The Wall Street Journal, AP, and PBS NewsHour. Farano said he is in discussions with other outlets as well. When users sign up for the app the first time, they select their interests and a time of day when they want their personalized newscast to begin. So at, say, 7 a.m. you get a push notification that your newscast is ready, and over breakfast, you can watch a series of videos — CNN on the latest from the Ukraine protests, AP on what happened overnight in Sochi, or Bloomberg’s take on Facebook’s purchase of WhatsApp. Farano said Watchup was able to increase user engagement because they made the “experience totally effortless.” Videos now start automatically when the app is launched and playlists can be personalized from there; they’ll also evolve as the app learns what kinds of videos a user prefers to watch. 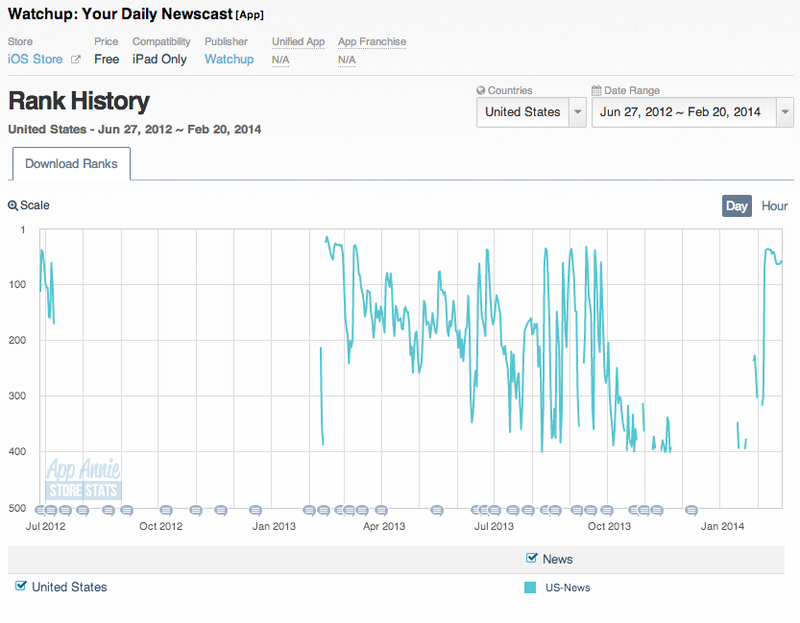 Users can also get more context on any story from a series of articles in a sidebar on the right side of the app. The new version of the app will advance its ability to personalize the newscast and also allow users to choose videos by topic in addition to channel, Farano said. It’ll also be the first version available for Android tablets. (It currently works on iPads and Google Glass.) Farano said they’ll be exploring specific deals with some OEMs. POSTED Feb. 20, 2014, 3:30 p.m.
Lichterman, Joseph. "Right back after these messages: Watchup adds ads and partners with The Washington Post." Nieman Journalism Lab. Nieman Foundation for Journalism at Harvard, 20 Feb. 2014. Web. 19 Apr. 2019. Lichterman, Joseph. "Right back after these messages: Watchup adds ads and partners with The Washington Post." Nieman Journalism Lab. Last modified February 20, 2014. Accessed April 19, 2019. https://www.niemanlab.org/2014/02/right-back-after-these-messages-watchup-adds-ads-and-partners-with-the-washington-post/.